“The people cast aside, those on the bottom, the people on the fringes of society are those who make the tough sacrifices,” she said. The scholar and sociologist shared personal stories, notably meeting King on several occasions, attending his “I Have a Dream” speech, and participating in the March on Washington. MLK Week kicked off with an opening ceremony and student keynote address by Kori Strother ’15. She discussed the tenets of a liberal arts education and how activism comes in many forms. Strother also addressed the continued struggle for racial equality on a national scale and issues surrounding inclusivity at Colgate. “Let’s take this first day of the semester to acknowledge both how far we’ve come and the extensive amount of work that needs to be done to move us forward,” she said. The week’s schedule offered events that focused on King’s mission. Professors Charles Banner-Haley and Engda Hagos led workshops on topics including civil rights and King’s dream; a panel of international students discussed the fight for human rights across the globe; and there were film screenings, student-led brown bags, and musical performances. The week concluded with an afternoon of community service by students, professors, and staff volunteers. Colgate has launched management practices for its on- and off-campus forests to reduce the university’s carbon footprint, another important step toward achieving carbon neutrality. 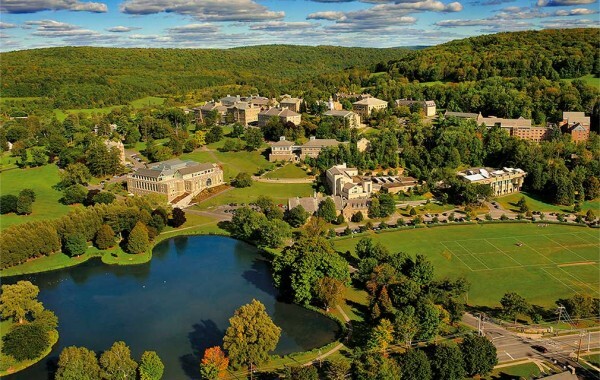 In addition to its 575-acre campus, Colgate owns 1,059 acres of forested land, including off-campus sites such as the Bewkes Center, Beattie Reserve, Parker Farm, a parcel on Johnnycake Hill, and more. The university’s goals for managing this land include using it for research and teaching; outdoor recreation and aesthetic value; conservation of ecosystem services and biodiversity; and timber production. Careful management of the forest will sequester approximately 1,500 tons of carbon from the atmosphere per year, according to Pumilio. The first steps of the forest sequestration project were implemented in 2013, when measurements were taken from 174 sample plots of trees to determine the amount of carbon stored there. In 2018, the same plots will be measured again, allowing the sustainability office to determine the actual sequestration of the forest since 2013, and how much carbon has been taken from the atmosphere since then. As part of this project, Colgate’s forest has been certified by the American Tree Farm System for long-term sustainable management, with the goal to maintain the forest so that it can exist indefinitely. Along with regular measurements of sequestration, the sustainable management of the forest also includes careful logging processes. “Harvesting select trees can be healthy for forests, and we do it in the most environmentally friendly way,” said Pumilio. The sustainability office is also taking these harvested trees into account when analyzing the university’s carbon footprint, tracking how much carbon was stored in them, how the timber is going to be used, and how its use, such as for furniture or paper, dictates whether that carbon is stored or released into the atmosphere. 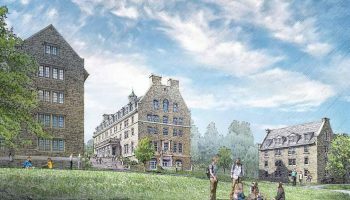 There have been 27 carbon-reducing projects implemented on campus since the President’s Climate Commitment was signed in 2009, promising carbon neutrality by Colgate’s Bicentennial in 2019. This spring, all three of the major student media organizations are undertaking a digital transformation. The Maroon-News, the country’s oldest college weekly newspaper, recently launched a redesigned website and has committed to reducing the number of paper copies on campus in favor of a digital audience. 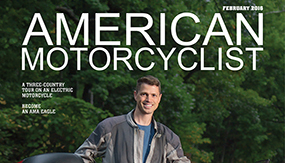 “Having an online presence is vital in 2015,” said Luke Currim ’15, co-editor-in-chief. “[The website] allows students and alumni to browse campus news from their phones, tablets, and computers, no matter how far from campus.” Currim hopes that this move will make reading the Maroon-News a more interactive and engaging experience for its readers. WRCU, the student-run and operated radio station since 1951, is broadcasting a whole new sound in 2015 thanks to a new state-of-the-art automation system. The NextGen broadcasting software will create a digital database of music, public service announcements, and audio recordings that can be programmed to play automatically on air, even if a DJ is not in the studio. 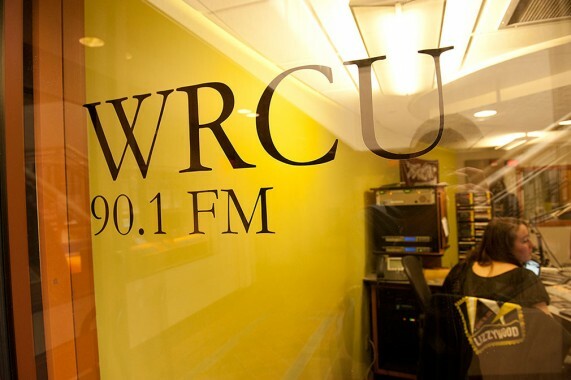 “Automation opens up creative space in our production department to create a unique sound that listeners can identify with WRCU,” said General Manager Zac Lomas ’15. “In further developing our brand, we can become a more dynamic and effective media force not only on campus, but also throughout the entire Hamilton community,” he added. CUTV has also reacted to the changing tide of digital media since its founding in 1981. The student television station has recently moved from cable access to instant access in a transition to an online provider. “We want to revamp CUTV’s image on campus and the best way to do that is through changing our tactics,” said Dave Purdy ’15, CUTV co-president. The new website features original content as well as free movie streaming tailored to Colgate students. “We’re moving, well, flying, into a more digital age every single day,” said CUTV’s Lizzie Marino ’16. Students are learning how to get even. In terms of salary negotiation, that is. We often hear about the wage gap in news, politics, and even Hollywood — with actress Patricia Arquette’s Oscar acceptance speech this year, the topic, once again, launched into national conversation. 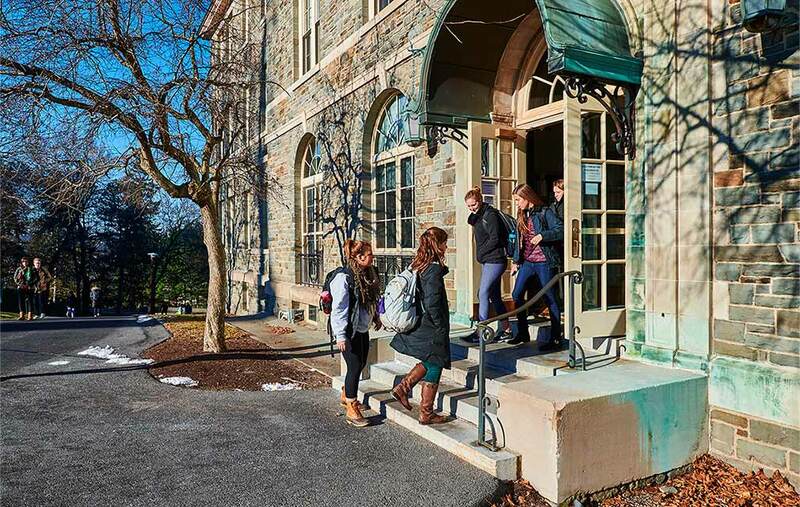 Although the discussion about how to close the wage gap persists, at Colgate, the career services department is giving the next generation entering the workforce a better chance at bridging the divide. Offered each semester, the $tart $mart program teaches the ins and outs of negotiating a salary or compensation package. Participants learn about the reality of the wage gap in the professional world, how to gather research about what an offer should look like, discover strategies for negotiating a salary, and become familiar with how to make a budget. 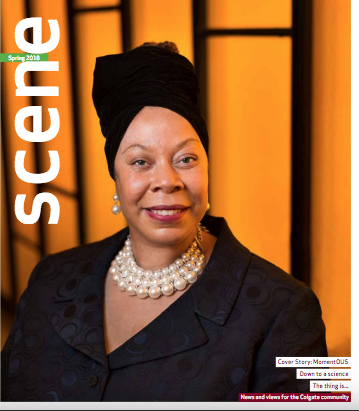 “We’re trying to teach students how to be confident in who they are, what they’re doing, and what they bring to the table,” said Teresa Olsen, director of operations and strategic planning for career services. The workshop focuses on helping those most affected by the wage gap — namely, women and minority groups — learn how to negotiate for a salary reflective of the value of their work. The American Association of University Women created The WAGE Project (Women Are Getting Even) to address gender inequality in professional compensation. WAGE started to work with universities to build programs and train facilitators to bring education and advocacy to college students. Career services, in concert with The Wage Project, brought $tart $mart to Colgate in fall 2013. 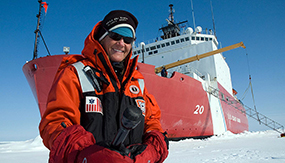 “We try to help students understand the [professional] landscape, what questions they should be asking, and that they should tap into all their resources when they go into a salary negotiation,” said Olsen. Aimed at helping seniors prepare for life after Colgate, $tart $mart is part of the Real World Series, which offers opportunities to build and exercise professional skills and ease the transition from the classroom to the boardroom. Other events include workshops on apartment hunting and personal finance. 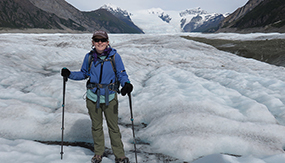 When Carolyn Baker ’05 came to Colgate, she had her sights set on medical school. “I had never wanted to be anything but pre-med,” she told the roomful of attentive students in Lathrop 207. “I was in the tunnel-vision mindset of wanting to be a doctor.” But Baker changed her goals in college after working with a dermatologist whose practice included a physician assistant. 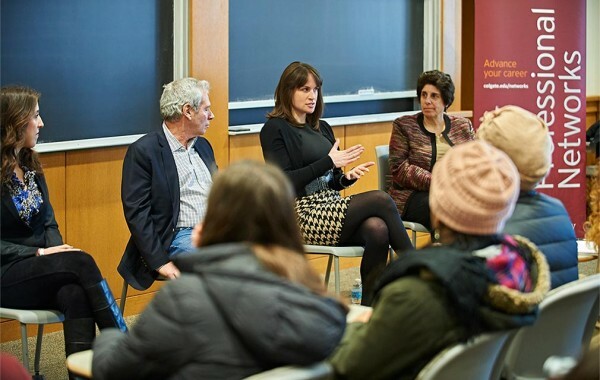 Now a physician assistant herself, with a plastic surgeon in New Hartford, N.Y., she joined three alumni on campus March 6 to tell students about alternatives to medical school. The other panelists included dentist Bob Raiber ’68; Erin Murray ’11, a health care administrator; and Rachel Stahl ’13, a clinical dietitian. Julie Chanatry, chair of the campus health sciences advisory committee, moderated. Panelists talked about their Colgate coursework, their graduate school experiences, and the paths they took after graduation. Students furiously took notes, asked questions, and soaked in every word. The alumni urged students to get involved with Peer Health Educators; Dr. Merrill Miller at the Student Health Center; and alternative break trips through the Max Shacknai Center for Outreach, Volunteerism, and Education. Additionally, they advised students to pursue independent studies. The panelists highlighted the importance of doing challenging coursework outside of the sciences, to gain critical-thinking skills, research techniques, and writing skills. 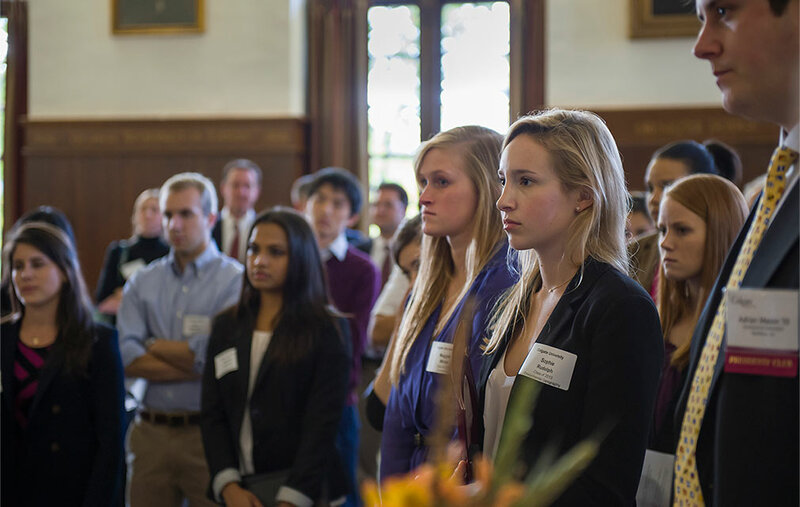 This event was sponsored by the Health and Wellness Professional Network, one of eight career advancement networks available to Colgate students and alumni. Featuring a fantastic mix of characters and a score that contains some of the world’s most cherished arias, Il Trovatore served as the starting point for this year’s Grand Opera Series at the Hamilton Theater. Members of the Hamilton community were able to view this stunning opera, written by Italian composer Giuseppe Verdi and performed in Berlin, Germany, from the comfort of their own town via high-definition screens and surround sound. Les Contes d’Hoffmann and Turandot rounded out the winter lineup this year. Headstands, handstands, and even shoulder stands were common sights during an Inversion Workshop at the Zen Den in January. Featuring guest instructor Eric Phamdo, the event allowed people to take yoga to the next level by practicing upside-down poses, which are said to improve circulation. Building upon success over the summer, the Hamilton Public Library again hosted Lego Fun in February. 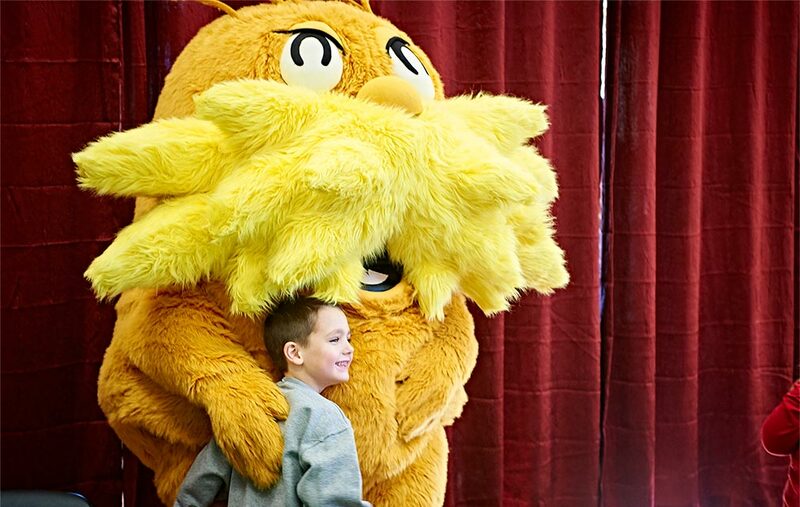 Inspired by programs at other libraries across the nation, the event encouraged creativity, exploration, and learning among people of all ages. Participants could build whatever they liked with the popular blocks, and the library put out a display of books about Legos, building, and design for inspiration. Even though years have passed since his death, Dr. Seuss’s 111th birthday vied for his most celebrated one yet. News of his forthcoming book What Pet Should I Get? surfaced and produced international buzz in late February. The Hamilton community designated February 28 as “Seuss Saturday” in his honor and kicked off the festivities with a proclamation by the mayor on the Village Green. The Colgate Bookstore, which had Seuss-inspired crafts and a visit from the Lorax, was just one of several locations that hosted a Dr. Seuss event that day. The Sigma Chi fraternity at Colgate will be suspended for five and a half years, according to a decision announced in February by President Jeffrey Herbst. Last October, the fraternity was found to be in violation of the university’s Hazing Policy, the Student Organizations Relationship Statement, and the Code of Student Conduct. Herbst’s decision is less severe than the sanction of “permanent withdrawal of recognition” that was recommended by the University Student Conduct Board, but more severe than the three-year suspension the fraternity requested in its appeal contesting the duration of the sanction. “I believe that this lengthy suspension recognizes the severity of the behavior of the chapter’s members, while also allowing the chapter an opportunity to rebuild in the future,” Herbst said. After the suspension term, which will end on June 30, 2020, the alumni of Sigma Chi, in conjunction with the Sigma Chi national organization, may petition Colgate’s president for permission to recolonize the chapter. Within the last 15 years, there has been a marked increase in awareness about hazing in college. This year, several reprehensible hazing-related incidents at schools around the country have made national news, and many schools have made a conscientious push to eradicate such damaging behaviors in Greek-letter, athletic, and extracurricular organizations. Colgate uses an educational approach to opening up discussion about the serious problems of hazing. On February 28, approximately 30 members from all eight of Colgate’s Greek-letter organizations gathered in Olin Hall’s Love Auditorium to participate in the New Member Education Summit. Students discussed what qualifies as hazing, and how to ensure that new members experience a healthy transition into Greek life. The summit centered on a lecture by Timothy C. Marchell, the associate director for health promotion and director of mental health initiatives at Cornell University. Marchell shed light on the variety of reactions that a person can have to a given situation with relation to past experiences and personal traumas. He also discussed the importance of marketing events to new members as fun bonding activities, rather than mandatory events shrouded in secrecy. For example, events such as scavenger hunts and skits may seem harmless, but, if framed incorrectly, can leave new members feeling uncomfortable or humiliated. After the lecture, each organization broke off into small groups for open dialogue, relating the points covered to their specific members. The summit was part of an annual series of anti-hazing events organized by the Office of Fraternity and Sorority Affairs and sponsored by the individual chapters. 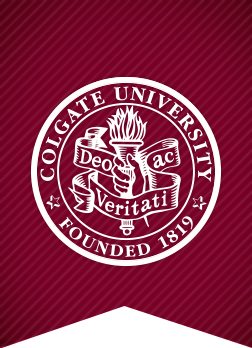 Additionally, Colgate has instituted mandatory Safe Zone Training and Bystander Intervention Training for all Greek-letter organizations in an effort to proactively prevent unacceptable behavior. 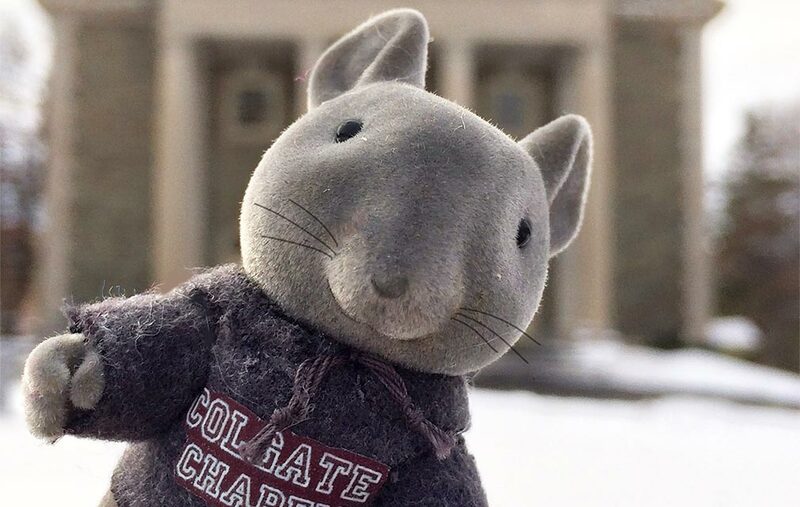 Meet Cole, the newest addition to the Colgate religious life family, and quite possibly the owner of the smallest Colgate sweatshirt ever. The Office of the Chaplains introduced their new mascot via Facebook on February 1. This particular animal was chosen to pay tribute to the students who affectionately refer to themselves as “chapel rats.” For them, the chapel’s basement (sometimes called the “Garden Level”) is a home away from home where they can spend free time studying, relaxing with friends, napping, and attending events. To introduce Cole, the chaplains’ office staff launched a weeklong scavenger hunt. Every day, they hid Cole in a different place. They asked those lucky enough to discover him to post a selfie with him on the Office of the Chaplains’ Facebook page in order to win a prize.